10-31-06– About the only thing giving me hope this weekend is that the nice landscaper doing the work at the house next door – four acres away, we wave – just started getting his shrubs in today. Heck, ours have been in for three weeks. But there is much left to be done, and until the irrigation is completed, the sod laid, the stonework swept and washed, the mulch primped and the Bobcat loaded on the trailer, I’m going to have to delay future updates. 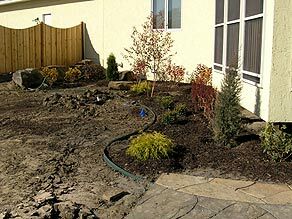 We should be at it about another week, not too bad, considering we started landscaping this new home in the far Northwest suburbs of Minneapolis on August 28th. 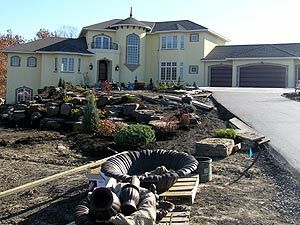 There was no driveway when we started (it just went in October 26th), final grade had not been established, and I was dealing with a magnificent home placed sideways into a hill requiring more than a little stone retaining work. One thirty-five foot New York bluestone walkway, one seven hundred square foot patio, one bistro table stone floor, one barbeque grill stone floor, one curving concrete swimming pool slab, one nine-foot tall stone water wall, one pond, four stone staircases, six hundred fifty feet of aluminum edging, forty yards of soil amendments, eighty yards of soil, three hundred and twenty tons of Minnesota Iron Range brown stone and two hundred and forty trees and shrubs later, a two month installation doesn’t seem that long. Luckily, the clients are sweethearts. Here are some additional pics. After I finish this one, give me, oh, one three-nighter in Vegas and about three weeks after that to get back to the point where I can at least spell my last name, then I’ll resume full updates. How does December 1 sound? Left: Cleaning the walkway will probably take about as long as the install. 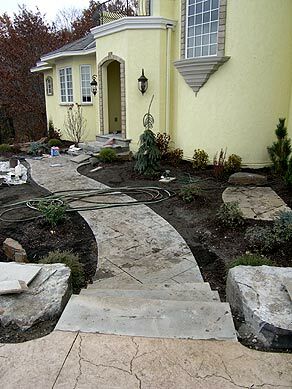 We installed the three bluestone steps (bottom of photo) one month before the decorative driveway pad was poured, remind me to tell you about figuring out that one sometime.Above: The clients wanted a spot in front for a two-chair bistro table, so here it is. 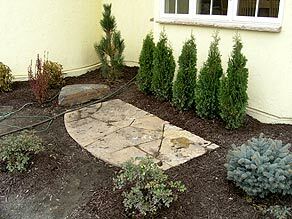 I used Desert Bronze to contrast with the bluestone. Oops, I still have to add about four stepping stones between the shrub roses. Grade issue: The pool was built up two feet above the patio. Brute stone to the rescue! 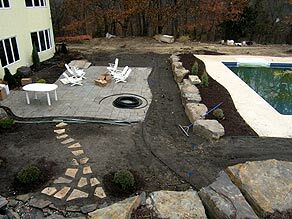 Designing the curves for the patio and the pool deck is a good subject for a future update. Sod runs between the two. Realize too that it was too late to plant perennials, so in all the shots, what’s missing are the perennials and annuals (and containers!) that will be planted next spring. More grade issues: A nine-foot cliff off the back of the house. 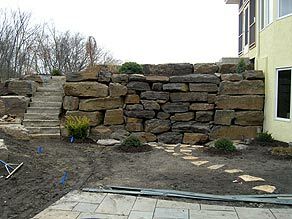 The clients didn’t want a waterfall-you’d hear it in downtown Minneapolis -so I did this water wall. The eight-foot wide, concave section in the middle is plumbed with five water lines, random top and middle, so that water flows down the face. We’ve shut it down for winter, but I’ll get a shot of it in action next spring-it looks really neat. A section of the foundation planting in back. 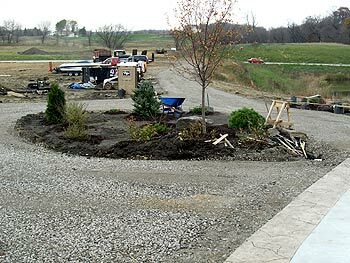 Total landscape planting area was 3,100 square feet. There are quite a few planting beds I didn’t shoot, including an additional stone outcropping wall on the other side of the house and a large bed that runs along one side of the pool. Where you see dirt there will be sod. 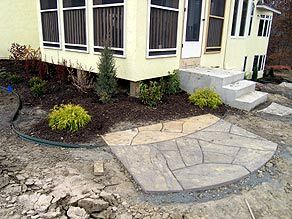 Clients wanted a stone pad for their barbeque just off the back porch, but rather than surround it with lawn, which would look kind of dorky, I pushed one-quarter of it back into the planting bed and continued the curved line created by the edging through the stone. That’s Pennsylvania Lilac in front and Desert Bronze in the bed, and when they’re cleaned and washed, oh boy. Remind me I still have to mortar that back stoop with Desert Bronze. 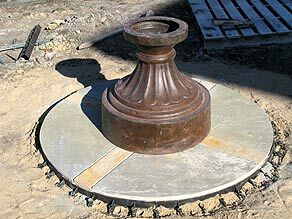 There are no perfect circles in nature, but when building a stone base for a large formal fountain, circles do come in handy. Electrical runs from the house twenty inches below ground in PVC pipe and rises through the stone floor to the center of the base. 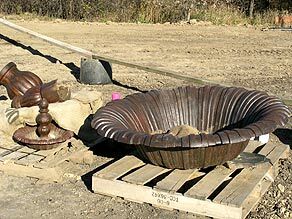 Here’s most of the rest of the fountain, it should be up and running as you read this, or, Plan B, I kick all the pieces off the pallets, lay sod around them, and call it a ruin. Heavy contraption; iron seems to be an ongoing theme at this joint. The stone we’re using goes by various names, it’s from Hibbing , and is the stone they scrape off before they strip mine for iron ore. So it has these tremendous rusty iron ribbons running through it, plus orange, blue, gold, maroon, brown and bronze. Just before sunset, it glows. Priced to the damn moon. When faced with a major house feature such as this round tower, my theory is, surrender to it. 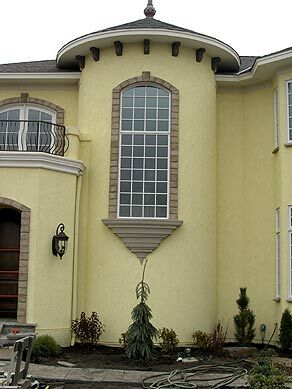 This weeping white spruce will mature about two-thirds of the way up the windows, at four feet wide. That’s plenty. The rest of all the tower wall space, what do you do? Leave it alone. That’s a Diabolo ninebark to the left, and it will eventually fill up that corner but will be pruned to stay five feet wide. The pine to the right is Arnold Sentinel, and it may someday hit twenty feet but stay five to six feet wide. Around the base, behind the weeping spruce, I went with three green-yellow variegated weigelas that will only grow four feet tall. I scattered outcroppings of the Hibbing stone throughout the landscape. 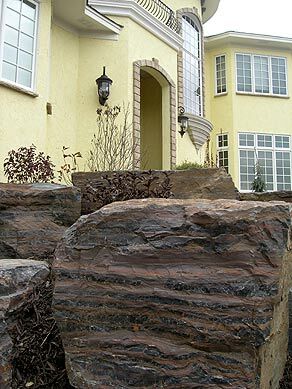 Because the stone contains iron deposits, it weighs much more than limestone or even granite. 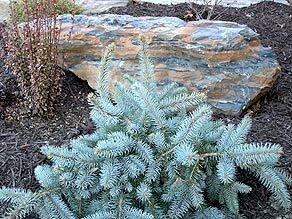 This boulder (serving as a backdrop to a weeping dwarf blue spruce) weighs around 600 pounds. With our cool October, I’ve had to pick away at the mortaring tasks, because it isn’t wise to mortar on a day when temperatures will dip below freezing that night. 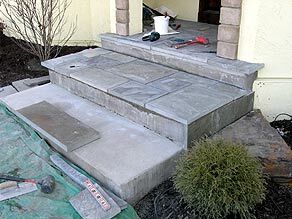 This is the main entryway stoop, completed on October 29, a sunny, gorgeous, sixty-two degree day in the Twin Cities.